about the challenge of understanding Russian policy. Much of the telecom world today considers NFV a riddle, wrapped in an SDN mystery, inside an enigma — the multi-vendor telecom network itself. Yet as puzzling as these new network concepts first appear, the basic principle behind Software Defined Networks and Network Function Virtualization is as old as networking itself: getting a critical mass of people to follow a standard way of communicating. Case in point: the internet took off because network suppliers and computer wizards agreed to adopt HTML as their standard way of rendering a web page. Well, the equivalent of HTML in the SDN realm is OpenFlow, a simple protocol that allows network devices from different suppliers — each with its own proprietary controllers — to communicate with others and enable services that operate independent of the devices underneath. And because OpenFlow has gained great momentum, true SDN orchestration of network components is now a reality. NFV is merely the next logical step — the ability to park multiple network functions (or services) on formerly single-purpose devices, and even allow those services to be fully consolidated on higher level network devices. The devil is in the details, of course, and that’s where our guest, Moshe Shimon, Vice President of Product Management for Telco Systems, provides us some invaluable insight. He clears away the confusion and explains the many technical repercussions and business opportunities driving SDN/NFV in a way that network laymen like myself can grasp. Dan Baker: Moshe, before we discuss your new NFV and SDN initiatives, it would be great to hear about Telco Systems’ business overall and the forces driving change in your world. Moshe Shimon: Sure, Dan. For the last 15 years, we have specialized in Carrier Ethernet Networks and sell a variety of network boxes that live in either the access network or aggregation layer. The main application areas we support are three: Business Ethernet, Mobile Backhaul and Cloud Networking. 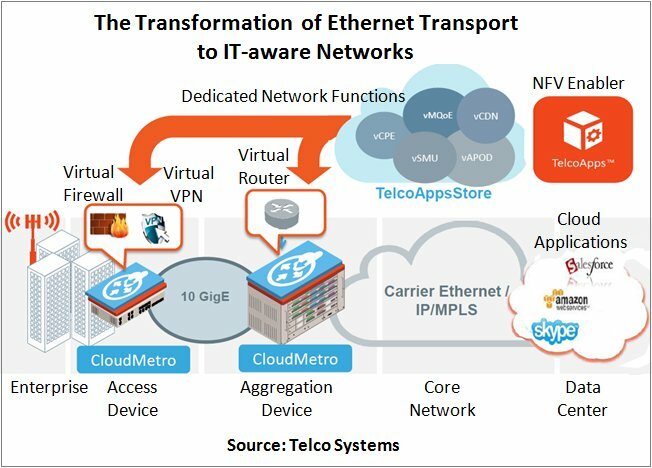 Now the Carrier Ethernet business has been a very exciting and dynamic market in recent years because operators have been pushing the fiber envelope. Today, there’s a big trend to upgrade from 1 Gigabit Ethernet to 10 Gigabit capacity at the access point. Part of that demand is being driven by enterprises putting more services and data in the cloud. Another driver is the incredible bandwidth mobile users have today. Here in Israel, my daughter uses 5 Gigabit each month on her cell phone. And it’s crazy how the prices have come down: a few years ago the average mobile user was getting only dozens of Megabits. Of course, operators are highly challenged to keep up with all these demands because it means buying and maintaining more and more costly equipment. Meanwhile, the Over-The-Top (OTT) players are the ones causing the bandwidth spikes that squeeze profits in the first place. So the question becomes: how can the operator provide the bandwidth everyone expects and still make money? And it’s that desire to find a better business model that’s driving the NFV and SDN trends. Can you explain how you are enabling SDN and NFV in your business? Well, Telco Systems has upgraded the same Service Management system we use to control our devices to include SDN functionality. And that SDN has in turn transformed our Service Management system into a full SDN controller, called TelcoController, that can orchestrate any network service supported by OpenFlow. The second step we took was to develop a new NFV solution called CloudMetro which is enabled by a dedicated CPU blade in both our access and aggregation devices. The CPU blade runs a new operating system called TVE (Telco Virtualization Engine) allowing us to host network-resident applications — or Network Virtual Functions (NFV). Examples of these applications include virtual CPE, virtual CDN , virtual tunneling, virtual FW and many others. So as you can see, this concept brings a fundamental change to networks — a shift from from single purpose devices to multipurpose devices. As more and more devices become SDN-enabled, the vision is to manage services end-to-end with much fewer hardware boxes and also skirt around the costly provisioning of proprietary devices because all that moves to the OpenFlow protocol. Aren‘t you taking a risk by opening up your devices to OpenFlow? What’s the impact on your software business? It’s certainly risky if you believe that SDN and NFV will not be adopted in the near future, but these standards are catching fire much like the rise of the IP protocol a couple decades ago. Our expertise in Carrier Ethernet is still very important. Ongoing R&D is vital to maintain an edge there. But NFV allows us be part of a much larger value chain that will enable network functions to be implemented better and at much lower cost. In short, SDN and NFV allow single-purpose hardware to be consolidated onto far fewer multi-purpose devices. Now playing in this SDN game, you naturally lose a bit of control since most applications that run on our access devices will soon be supplied by third parties. But that loss is balanced by the value of our new openness. Today, any third party function or service that supports OpenFlow can run on Telco Systems hardware. That’s a powerful statement to make since we’re one of the first network equipment vendors to support this big trend. For instance, through the new TelcoApps software on our devices, we are now enabling virtual services such as vTunnels, a virtual cloud tunneling, vFirewall, a virtual firewall, and also virtual Quality of Experience. Some of the applications we will develop ourselves and sell to third parties. For example, a microwave vendor is going to run NFV and we can sell them our applications and they can install on their devices. So software is being sold in two directions; it’s a much more open game. And it will certainly get more interesting when Telco Systems devices are SDN-orchestrated by a large system player like an HP or Alcatel-Lucent. What about your Service Management system? Does that become less important over time? Yes and no. The ideal environment is a hybrid one that combines OpenFlow functionality and traditional service management functions. For instance, for certain carrier-grade features such as QoS monitoring and OAM, you need higher functionality than Open Flow supports today. And there’s no question that service providers are tired of the current service management model. It costs them too much to provision and automation is essentially blocked. If a customer wants to add a firewall, you shouldn‘t need to contact the supplier to get that change done. Operators and their enterprise customers want a faster, more industry standard way of modifying the network. In many cases, the changes will be made by the operator’s enterprise customer using a self-serve network management portal, a tool we provide today to our customers, that allows them to go inside their WAN resources and adjust and tune each service they want to change. Our SDN controller will support the option to orchestrate the NFV and TelcoApps so the enterprise customer can turn up new services in minutes. What’s going to happen to the many network equipment vendors selling dedicated appliances? Over the long term, those dedicated appliances will migrate to the network itself. A dedicated appliance box is still viable, but it will be harder to justify because putting those functions on a multi-purpose ecosystem will be cheaper and far easier to manage. While Telco Systems is putting a distributed NFV capability inside our Carrier Ethernet CPEs and aggregation platforms, we are not directly competing with the appliance vendor — just developing an ecosystem that allows the appliance vendor to run their software on our CPUs in our access infrastructure. We call this trend “IT aware networks” and it really empowers the operator. At a recent trade show, we demoed Checkpoint software running on our devices. Writing our own firewall or DPI capability makes no sense for us: we want to buy that off-the-shelf, so we are building an infrastructure that the operator can take and run those applications on our devices. This is our TelcoApps concept in action. What sort of savings are operators going to realize in the future? The network today has too many dedicated devices, making it more complex to manage, making both opex and capex costs higher. But by replacing dedicated CPEs with multi-function CPEs, capex cost savings will probably be around 40%. And when you no longer need to install, manage, and individually configure all these dedicated devices, opex costs can go down by 80%, we figure. Another change is that the functionality for a layer 3 CPE can move up in the hierarchy -- into the aggregation layer where many CPEs can be managed in one place. And when the device itself is running as a virtual process so you can remove the dedicated appliance altogether because it’s running as a service on a CPU blade in the aggregation layer. However, certain devices such as the Carrier Ethernet devices that Telco Systems sells must remain in the access layer because they are not pure layer 3 devices, but bridge to layer 2 physical fiber. We’ve talked about cost savings and automation benefits, but what sort of business opportunities does NFV/SDN open up for service providers? To me, Dan, new business models are a vastly overlooked benefit of SDN/NFV. For example, today enterprise customers are buying dedicated appliances from tons of small appliance firms and integrators. This is a market that telcos can‘t play in right now. But as enterprises begin outsourcing IT to the cloud, this opens up a fantastic opportunity for operators to sell NFV-enabled services like network management, security, and other services to enterprises. And by consolidating on the NFV cloud, enterprises can save themselves a ton of money versus buying those as siloed appliances from dozens of suppliers. Take network management for an enterprise as an example. Let’s say the enterprise user has two applications: SalesForce.com and Amazon Web Services. Since everything is orchestrated — and DPI capability at the access point allows you to know which user is accessing what applications — you can deliver prioritization on demand. The operator can now fully differentiate among users and services. In the U.S., Netflix is now paying Comcast to deliver a better quality of service for Netflix customers. Well, if you enforce QoS inside the access point, you now have a fully IT-aware application all the way from the customer’s CPE to the network core. So distributed NFV and SDN flips the tables on OTT players. Now OTT players who truly partner and cooperate with the service provider are rewarded, and that’s a game-changing capability for operators. Moshe, thanks for stripping away many layers of complexity around NFV/SDN. You make a compelling case that the trend will make network capabilities far more affordable and simpler to manage. But my biggest take-away from you is that NFV/SDN also drives some exciting new business models and revenue opportunities for telcos. Moshe Shimon is Vice President of Product Management for Telco Systems where he is responsible for the strategic planning and development of new IP products. Prior to joining Telco Systems, he served in product management positions with ECI and Nokia Siemens. With 15 years experience in telecom, mainly in packet and switching technologies, Moshe holds a B.Sc. in Electrical Engineering from Ben-Gurion University, and an MBA degree from Haifa University, Israel. Network Pioneer Explains the Tech Shift & Fresh Business Models Driving NFV/SDN — interview with Moshe Shimon — Software Defined Networks (SDN) and Network Function Virtualization (NFV) are revolutionizing the world of telco networks. Now, a Carrier Ethernet equipment provider is among the first to fully support these trends. The interview clears away the confusion and explains the many technical repercussions and business opportunities that are driving SDN/NFV. Analytics Pioneer: Price Jockeying is an Old Tactic; Fresh Service Ideas Key to Telco Value Creation — interview with David Leshem — Can billing innovation sustain the telecom industry in an age of fierce competition from service providers and Over-the-Top players? An analytics pioneers weighs in on the issue and explains why complex pricing schemes don‘t have a bright future. Using anecdotes and personal stories, he shows why the answer lies in fresh, innovative services, the kind that comes from thinking totally outside the telecom box. Wireless Providers Beware: A New Sheriff is Coming to Town... Apple — by Brian Silvestri — Apple’s new iPhone Upgrade Program allows subscribers to buy unlocked phones and once-a-year upgrades direct from Apple stores. A wireless business consultant discusses the threat and the options carriers have to maintain their position in the consumer ecosystem. Dogfight in the Cloud: Time Warner Cable Maneuvers Its Ethernet & Bigger Footprint to Win Enterprise Biz — interview with Jitesh Bhayani — Service provider competition in the U.S. is steadily shifting to the advanced cloud, data center, and connectivity needs of large enterprise. Hear how an MSO has joined the dogfight armed with Ethernet, a national footprint, and SLA guarantees. Mobile Business Shock: Device-Driven Research Spots Revenue-Impacting Trends — interview with Chris Hill — OTT players and mobile apps have brought great unpredictability to the network profitability equation. But now, using a mobile crowd sourcing solution serving millions of subscribers, market research intelligence now enables operators to measure the usage uptake of cellular networks vs. WiFi, Facebook vs. Google+, and T-Mobile vs. EPlus. Mobile Money: An Expert View of Where It’s Headed and Telecom’s Likely Role — interview with David Birch — Few topics are as muddled or wrapped up with as much hype as telecom’s potential role in mobile money and mobile payments. In this interview, a global expert discusses a broad range of topics: mobile vs. credit cards; fraud concerns; a Kenyan case study; the regulatory climates of Europe and the U.S.; the battle between banks and retailers; and and the considerable value a mobile wallet has even when there’s no money in it. The NetCracker 2010 Global Service Provider Survey: An Independent Analysis — by Dan Baker — Technology Research Institute (TRI) analyzes a Netcracker survey of 50 global B/OSS managers and executives at mid- to large-sized CSPs. The article interprets their view of business challenges, growth opportunities, and competitive threats. Pumping Gold Through Dumb Pipes: Creating Value Streams for Over-The-Top Partners — interview with Steve Cotton — Why worry about business lost to over-the-top (OTT) players when operators can grow the larger pie by focusing on where a CSP adds to the overall “value stream”. This article explains how telecoms can successfully leverage their customer intelligence to deliver narrow-casting, better marketing, timely pricing — often delivering these as a service to the OTT partner.